The Pulitzer Prize winner builds on his reputation as an iconic investigative journalist, skewering the conventional wisdom about the death of Osama bin Laden. In four linked essays originally published by the London Review of Books, Hersh (Chain of Command: The Road from 9/11 to Abu Ghraib, 2004, etc.) excoriates President Barack Obama, some of his national security aides, and members of the military for allegedly lying repeatedly about covert international maneuvering. Although satisfied that bin Laden is indeed dead at the hands of the U.S. military, the author wonders how Pakistani leaders could have been unaware that the terrorist financier and spiritual leader was residing in their midst. 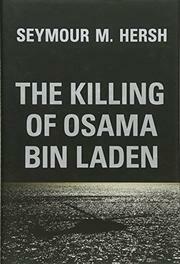 Hersh questions the White House version of how bin Laden was discovered inside his housing compound, whether American Special Forces acted independently of the Pakistanis, and whether bin Laden's body ended up at the bottom of the ocean, as publicly stated. The title essay focuses on bin Laden, while the other three build on that topic to delve into American conduct in Iraq, Libya, Afghanistan, Turkey, Syria, and other countries invaded by the U.S. under George W. Bush and Obama. To push his compelling scenarios and larger themes about the government's "high-level lying,” Hersh relies heavily on unnamed sources—even more than much of his previous reporting for the New York Times or the New Yorker. His reliance on anonymous sources has led to questioning of his newspaper, magazine, and book exposés dating back to the 1960s, but his reputation for accurate journalism remains intact with numerous editors and readers. The essays are densely composed, sometimes presupposing extensive reader knowledge about American military and diplomatic involvement in the affairs of geographically remote nations. Context beyond the content of the London Review of Books pieces would have added value to Hersh's reporting.